Generally speaking, photography is the use of light to create an image. Night is without the sun, so light sources are created by humankind. The photographer uses these sources of light to create artist renditions of night scenes, fireworks, the moon, or portraits. In the exposure equation, the photographer needs to manipulate either or all of the following: ISO, Aperture, or Shutter Speed. It is advisable to use a tripod. The first image here is from a large fireworks display. I used a tripod, and a long exposure to capture the lines of light. The exposure was F11, 8 seconds at 125 ISO. 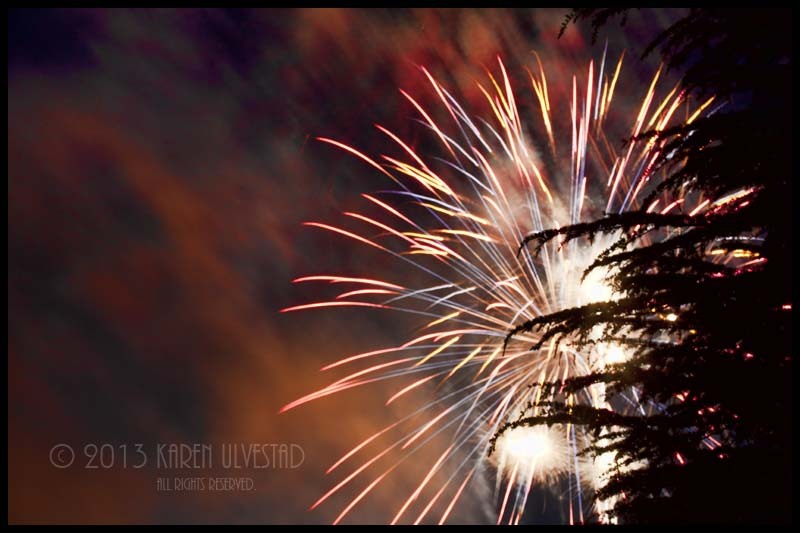 The watercolor wash feeling of color is from the fireworks reflecting off the smoke. TIP: Pick a spot to shoot from, pre-set the exposure, and use a tripod/shutter release. In this next photograph, the fireworks are used to create a portrait of the child. 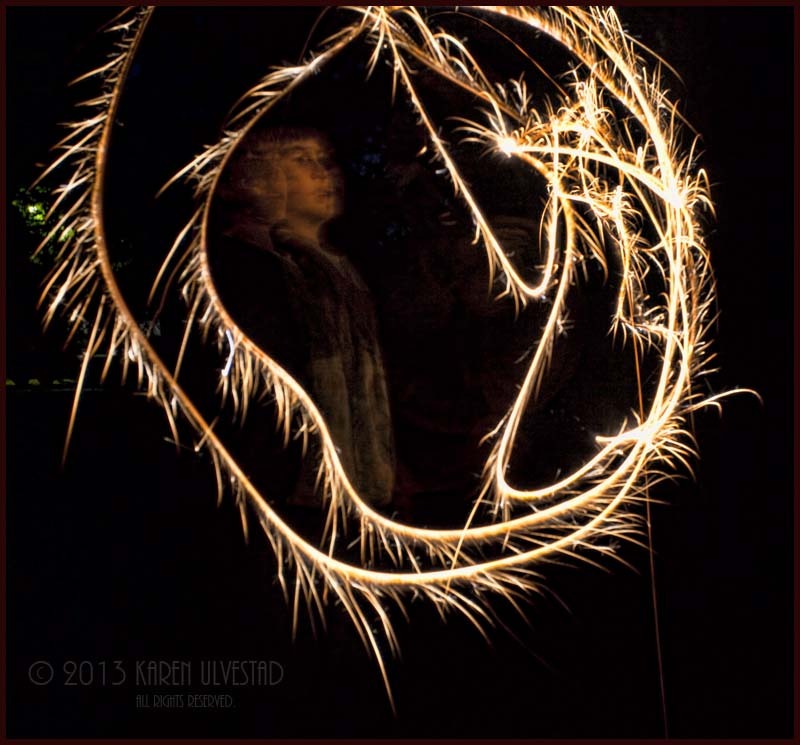 This is a sparkler, and it casts an incandescent light color on the subject. The green light in the background is fluorescent. This was shot with a Daylight White Balance. The exposure is F5.6, 4 seconds at 100 ISO. I used a tripod. The color of the sparkler will show in the photograph. This was a gold (or yellow) sparkler. It’s good to dress the subject in medium-toned clothing, which will stand-out from the dark background and bright light of the sparkler. TIP: Have the person hold as still as possible, while moving the sparkler. 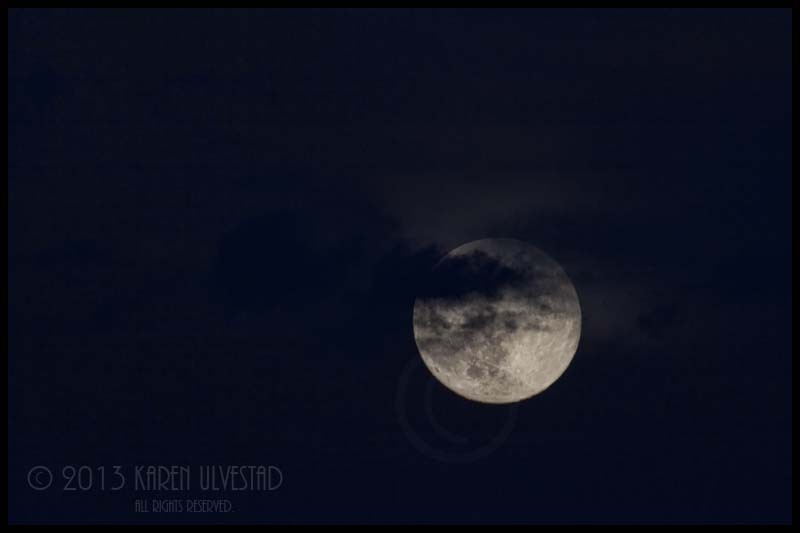 This last image is of the “Super” Moon last month. The exposure for this image is F16, 1/100 second at 400 ISO. The moon is very bright, due to the fact it reflects the sun’s light. To expose it and show the craters, the photograph must be under-exposed. This means to let in less light than the light-meter in the camera indicates as the correct exposure. For more detailed information on exposure and camera operation, I will be teaching classes through the City of Edmonds this fall. ← Making Artistic Choices. . .